Shear Heating - Beaumont Technologies, Inc.
Shear heating is a temperature rise due to viscous dissipation (commonly referred to as shear heating). Shear heating occurs as plastic flows through a closed channel. This can include the molding machines nozzle and the molds sprue, runner, gates and cavities. The pressure to drive the melt through these channels is quite high and can exceed 40,000psi. The first law of thermodynamics, known as the law of conservation of energy, states that Energy can neither be created nor destroyed; rather, it transforms from one form to another. During injection molding, the pressure driven flow consists of both internal and kinetic energy where its mechanical energy is transferred into thermal energy (heat). The combination of the relatively high viscosity and high shear rates, experienced by plastic flowing through a runner, can result in significant viscous dissipation. The high energy required to drive the melt through a closed channel (pressure driven flow) is a result of the high frictional forces developed between the stationary walls of the channel and the flowing polymer melt. The shear rate distribution across the flow channel is significantly inverse to the velocity profile of the non-Newtonian flowing melt. As flow is laminar during injection molding, the highest shear rates are in the outer laminates, adjacent the stationary wall, and drop down to zero in the center of the channel. As a result the shear heating is concentrated in the outer laminates where shear rates are highest (see Figure 1). 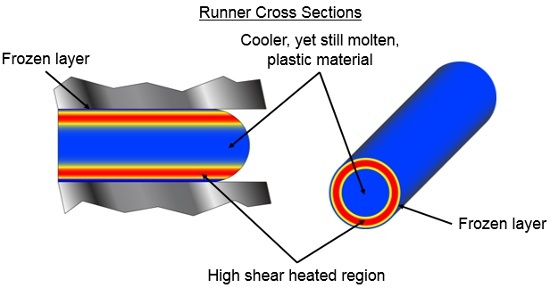 Studies using injection molding simulation have shown that shear heating in the outer laminates of a melt flowing through a runner can easily exceed 100F. Connect with us on social media to stay updated on the latest from Beaumont. INTERESTED IN FINDING OUT MORE? HAVE A QUESTION FOR US? CONTACT US AND WE’LL GET BACK TO YOU STRAIGHTAWAY. © Copyright 2019 Beaumont Technologies, Inc. All Rights Reserved.